AT THIS TIME, WE ARE CURRENTLY BOOKED. Please read the info below on alternate options for getting some portraits taken. 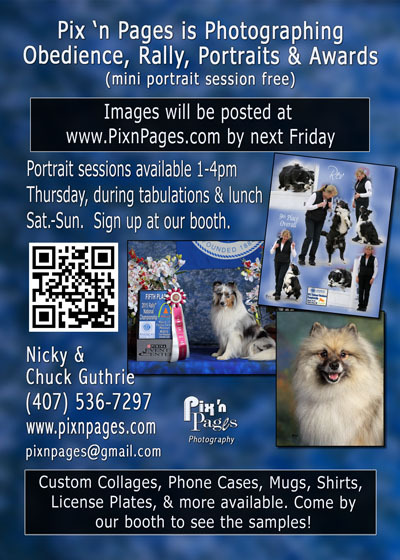 We will be taking portraits during awards tabulations and after awards presentation on Friday, Saturday, and Sunday. We will begin as soon as the rings are finish. These spots are first come first served as we don't know the exact start time or how much time we will have. Please be patient with us. We will take as many people as we can for as long as we can without rushing anyone through their session. If you wanted a session on Thursday but weren't able to get one, please check in throughout the day for cancellations or small open time spots. We may be able to stay past 4pm but at this time we cannot guarantee that. Please come by the table on Thursday and ask if we will be staying later. Please find additional information below the sign-up. Minimum purchase is an 8x10 for $30. The complete price list is on the table (and on the web site). Custom collages, digital retouch, holiday cards, shirts, mugs, crate tags and license plates also available. 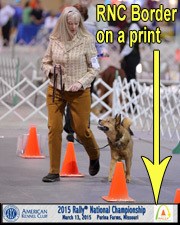 2016 AKC Rally or Obedience Border - will be on all action images unless requested otherwise. We will be photographing all competitors during Nationals. There is no need to sign-up unless you want a portrait session. Links to images will be posted on this page by Friday, March 25. You will receive an email when the mages are posted. Commemorative Border will be at the bottom of all obedience and rally action images (print and electronic) unless requested otherwise. It WILL NOT cover anything on the print (see image), nor will it be on awards or portraits unless you request it in "Comments" at check out.